Hotshots work on a burnout operation for the Meyers Fire in the Deer Lodge and Bitterroot National Forests in Montana, which has burned more than 60,000 acres of land. CityLab: Breathing the air in Missoula today feels like chain-smoking Chesterfields. Schools aren’t letting the kids out at recess, and public health authorities are saying active adults and children should avoid outdoor exertion. It’s easy to get the impression that this is an extraordinary and unprecedented fire season. But you study forest fires over a timespan of thousands of years. How unusual or unique is this fire season? Philip Higuera: It’s not—even in the context of the 21st century. In the Northern Rockies, we had a very large fire year in 2012, in 2007, in 2000, and to an extent in 2003. In this region, 1910 remains the record-setting fire season. If we surpass that, I would be surprised. Events like these are not common on a year-to-year scale. On the other hand, when you look at the role fire plays in ecosystems, you have to look at a longer timescale, and these rare events are what’s expected every once in a while. CL: Why is this fire season so dramatic? PH: The main reason there is so much burning right now is the strong seasonal drought across the region. The term we use is that these fires are “climate enabled.” The drought makes most of the vegetation, live or dead, receptive to burning. In Missoula, we had the driest July and August on record and the third-warmest July and August. With those types of conditions, we expect widespread burning. But people underestimate the role that seasonal climate plays in these events, and we start to grasp at lots of other things to explain it. CL: Aside from the bad air, are most urban residents in fire-affected parts of the West safe? PH: Aside from that really important impact, I give a cautious yes. There is a risk. And that risk is highest in the wildland-urban interface. If you are living there, you should know that you are living with a much higher risk for exposure to wildfire. And part of the job of educators and U.S. Forest Service outreach is to make that risk known. Eventually insurance companies will also get on board. Floods are obviously on insurance companies’ radar front and center. Wildfire is still not frequent enough that they design programs around it. CL: Should people in the fire-prone West be living in places like that—in the suburbs and exurbs out in the forested edges of urban areas? PH: Every place on our planet has some natural phenomenon that is not friendly to humans. If you live on the East Coast, you are going to experience hurricanes. If you live in the Midwest, you are going to experience tornadoes. If you live across forested regions in the West, you are going to experience wildfires. We need to develop in a way that is cognizant of these processes—that is not ignorant of the way the planet, and the environment you live in, works. CL: Why are these fires so hard to put out? PH: This goes back to why the fires are happening. The fuels are extremely dry. And most areas burn during extreme weather conditions—the days when it’s hot, humidity is low and there are high winds. These are the conditions in which fires quickly double in size. They are also the conditions where it’s most dangerous to put people in front of the fire. Also, a lot of these fires start in very remote areas with rugged terrain, and just putting people on the ground comes with some risk. 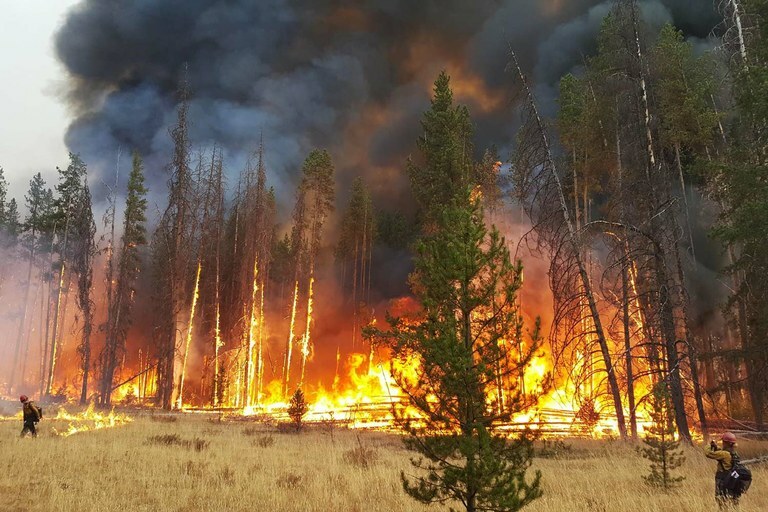 CL: Montana alone has already spent tens of millions of dollars trying to suppress wildfires this summer, and two firefighters have been killed. Is that having any impact, or is it like driving down the expressway throwing bags of money out the window? PH: When you say it’s not working, the key question is: What’s the goal? “It’s not working” assumes the goal is to have no fires. We will fail if that is the goal. Most of these ecosystems that are burning have evolved with fire. We expect them to burn. We need them to burn if we want them to continue to exist. CL: So it’s like trying to stop rain? PH: It’s like trying to stop an earthquake. Trying to stop a volcano. To me, the goal can’t be to have no fire. That’s gotten us into trouble when we pursued that goal. I think the metric should be how much area has burned that we wanted to burn compared to how much burned that we didn’t want to burn. Or closer to the nugget, how many resources were harmed—how many houses were lost, how many people were either directly or indirectly killed? CL: You don’t see raging forest fires as a failure of suppression efforts? PH: No. Knowing how climate enables and drives these large fires, I think that it would be impossible to put these fires out. CL: There is a school of thought that says we should not suppress wildfire because it allows smaller trees and underbrush to accumulate, which leads to larger, hotter fires later. So why not just let it burn? PH: I think as soon as you live in these environments you will quickly abandon that too-simplistic view. Maybe when I was a graduate student living in Seattle that seemed more like a possibility, but you can’t just let it burn. That would not be wise. It really comes down to what you can afford to burn and what do you want to protect. If the fire is in the wilderness, that’s great. If it’s burning toward a community, that’s not so good. CL: There’s good fire and bad fire? PH: There is a spectrum. On one end of the spectrum would be the wilderness fire that is not going to impact anyone—good fire. The fire that burns down your house or kills people—bad fire. CL: Another school of thought says we should allow more logging to clear trees and help prevent wildfires. Does that hold water? PH: I don’t think that holds water. That is based on the assumption that fires are occurring because there is more fuel available to burn than in the past. That’s generally not what’s driving this. It’s the drought. It’s true that if cut, there is less fuel in the forests. But in a lot of cases, there is what’s called slash—woody debris—left on the ground that will carry fire across the forest floor, which is what you need for it to spread. CL: Is climate change partly to blame for this year’s fires? Are wildfires in the West set to get worse because of it? PH: That’s what future climate models project. We can’t say this individual fire was because of climate change. We can’t say this year was because of climate change. But these types of years are what we expect to see more frequently. I heard an analogy that I think is useful. If a baseball player is using steroids and hits a home run, can you attribute that home run to steroids? You can’t—but you know that at some point some component of that was brought to you by this artificial input to the system. CL: What are you and your family doing to live through the fire season? PH: Personally, I made the decision to not live in the wildland-urban interface. I live in the urban part of Missoula. We had one HEPA air filter. Last week we ordered two more. That’s our adaptation.